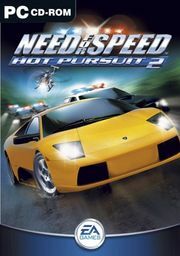 Need for Speed, the award-winning arcade racing game, is back and better than ever in Need For Speed Hot Pursuit 2! Staying true to its heritage, Hot Pursuit 2 houses a stable of exclusive, exotic cars from the world's most coveted licensors including Ferrari, Porsche, Lamborghini, Aston Martin and McLaren. Race through an array of open road environments that come to life with river crossings, waterfalls, beaches, dusty paths, and brush fires. Rush through traffic, conquer multiple racing events, and outrun cops in hot pursuit to become the Champion Road Racer! It is the last title in the Classic Era of NFS and won the Console Racing Game of the Year award in 2003 and was also notable for its more HD graphics at the time compared to previous installments, as well as helping popularize NFS before Underground. Two different versions of the NFS:HP2 were produced. The Xbox, GameCube and PC version were developed by EA Seattle, a subsidiary of EA Canada, while the PS2 version was developed by the newly acquired Black Box Games in Vancouver, B.C. Canada. While there are many similarities in overall design and theme, the two versions have a wide range of differences. A large list of these can be found on the Need for Speed Hot Pursuit 2 Versions Comparison page. The PS2 version is widely held to be the superior game, with that version drawing 9/10 from most reviews, while the PC/GC/XBox version generally pulls 7 or 8 from 10. Quick Race - "Go straight into the action!" - Here you can jump straight into a pursuit in a random car on a random track. You're The Cop - "Fill your ticket quota for big points!" - In this mode you drive the cop car and need to apprehend speeding drivers. Challenge - "One-player and two-player challenges." - Set up a custom pursuit with the car, track, opposition and options of your choice. Ultimate Racer - "Beat the heat in 30 events." - The Hot Pursuit Career mode consisting of a tree of over 30 pursuit events. Quick Race - "Go straight to the action!" - Jump straight into a race in a random car and track. Challenge - "One-player and two-player challenges." - Customise and race with the car, track, opponents and options as you want them. Championship - "Real cars, real fast in 30 events." - The World Racing career mode consisting of a tree of over 30 racing events. This page was last modified on 6 February 2010, at 07:52. This page has been accessed 202,334 times.